Another long weekend bites the dust - we hope that you have been spending time this summer, both on and off the links with family and friends. We continue to experience an unusually cooler summer with many sporadic and short bursts of rain. Despite all this, we have seen many of you numerous times and a welcoming number of new faces to the course this year. Let's keep our fingers crossed for more nighttime rain with sunnytime days throughout the month of August. 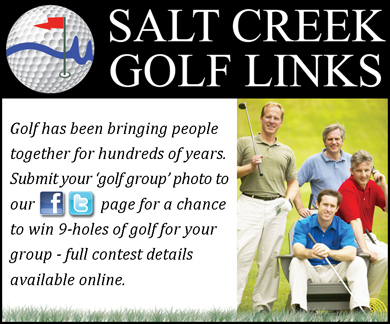 Every month, our Proshop randomly selects a number of engaged golfers to win 9-holes of golf at Salt Creek Golf Links. We know how much you enjoy the chance to win free golf passes and we would like to share with you some great ways that you can become and continue to be engaged within our golfing community. 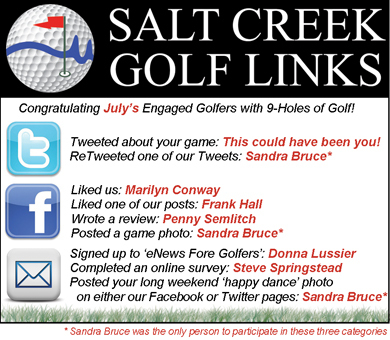 Congrats to last month's engaged golfers! Print off and present this coupon at your next round of golf to receive a FREE SLEEVE OF GOLF BALLS. Some conditions apply. We hope that Salt Creek Golf Links continues to be a preferred destination for your golfing needs and our clubhouse staff and greens keeping crew look forward to seeing you on the course throughout the season! For tee time reservations and/or general inquires about golf tournaments or the course in general, please contact the clubhouse at (866/705) 924-1521. Copyright (C) 2014 Salt Creek Golf Links All rights reserved.